This is how they nail you. How cruel and dirty-handed of them, to force me to deny that I spent my weekend raising money for the UK’s leading charity for learning disabilities. But these newspaper drones don’t dare piss off Steve and get left out of the Beatles event next week. You people are smart, though. Look at all the online articles about this “surprise gig.” No one you trust claims they were there, and what else do you notice? None of the photos they run are from the event. They’re all stock shots of me and Edge from last year. Edge is wearing the cap he threw out last Boxing Day after my daughter knit him a new one. We played a Mencap benefit just this past August. It’s in Wikipedia. Whoops, it was there. Steve’s gotten to them, too. I’m too exhausted and punchy to go on about it. I’ve been up all weekend with the Google kids launching our (RED) Ads by Google campaign, which marks up Google text ads in bright red for an extra 40% CPM that goes to the Global Fund. The Googlers got on their special phones (I sent Edge a photo of one from my red iPhone. He says they’re called Andromeda and they run a Linux operating system and can route calls through GPS satellites, which opens up tremendous possibilities for Africa) and lined up some advertisers for a test run. We’re cranking right through the U.S. Thanksgiving holiday weekend. I get the feeling they don’t much like holidays anyway, these kids, because they’re expected to log out and try to talk to their families, who can’t possibly imagine what their lives are like. Same as me. Jesus had this problem, too. Life gets crazy when you reach the point where the media shows you in places you’re not. Check out this loonie walking around the Demo trade show last year. They didn’t ask him for ID or give him a badge. CNET, desperate for some buzz from a stupefyingly dull tech industry marketing event, ran the story even though you can tell they knew it wasn’t me. The guy wreaked havoc on my investment work with Elevation Partners over on Sand Hill. Coco at Elevation is still scouring the Internet for photos he took with reporters and fans. 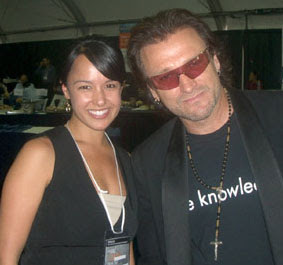 She has to email or call people like poor Natali Del Conte above, and hit them with three chords and the truth: That wasn’t Bono. It’s tough. Invariably, people want to believe they’ve met the real me. 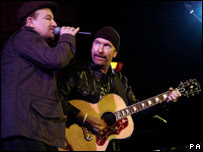 This is why U2 still does hundreds of shows a year. To remind people what’s real. Unless I’m onstage with my mouth open, or giving the slide show presentation about Africa I created with Al Gore, or in bed with my wife (which I haven’t been enough of lately but that’s another post,) any idiot could walk around in sunglasses and a rosary and take my place on Earth. Outside of our shows and World Bank meetings, well-meaning people fall for fakers all the time. Jesus, as far as I know, didn’t have this problem. Until later on.